How many Sinn Féin policy positions have Fianna Fáil copied in their comeback? FIANNA FÁIL are back. The Irish mainstream news media have declared it. Though their return owes more to a Rocky movie plot than reality, here’s a spoiler alert – Fianna Fáil never went away. Fianna Fáil have looked over the abyss, were buried, dead in a toxic dump, but now they and party leader Mícheál Martin have been resurrected. Nope, not messing, Martin is now a Man of Iron, courtesy of John Drennan in the Irish Independent. “Fianna Fáil claw back support” is the Star headline for this poll. “Fianna Fáil on the rise” writes the Mirror, while the Sun declares: “New poll shows FF on mend.” The Examiner reports that Fianna Fáil’s “recovery is continuing”. “Fianna Fáil bounces back in polls,” according to the Mail. In 2013, the Fianna Fáil media bandwagon continues. 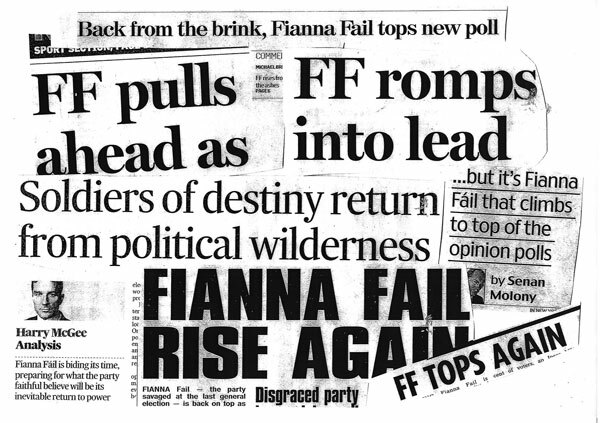 By March, the Sunday Independent has the front-page headline “FF romps into lead” (in February it was “FF pulls ahead”). “50 Coalition TDs could fall as FF popularity soars” trumpets another Sindo headline. “Soldiers of Destiny return from political wilderness” is the title of a Harry McGee Irish Times ‘analysis’ on 29 April. “Toxic party inches its way back from the political abyss” is the Sunday Business Post slant a day earlier. It wasn’t just the Fianna Fáil ard fheis that fuelled the ‘comeback’ hype. It has been driven by sloppy reporting of opinion polls, heightened by the arrival of regular Millward Brown polls in the Sunday Independent, and Behaviour & Attitudes polls in the Sunday Times along with the Red C polls in the Sunday Business Post, and the long-term relationship between The Irish Times and Ipsos MRBI. Fianna Fáil have been the beneficiaries of a type of political journalism common around the western world. It is driven by horse-race reporting of opinion polls, the need to create a simplistic fictional plot of victors and vanquished. Driven by hype or denunciations, you are either on the way up or on the way down. There is no sensible space where you can evaluate what a party’s policies actually are. For example, how many Sinn Féin policy positions have Fianna Fáil copied in their comeback? In February, Mícheál Martin said there was “no compatibility” between Fianna Fáil policies and Sinn Féin. At the FF ard fheis weeks later, Martin proposed a €4billion capital programme funded from the National Pension Reserve Fund. 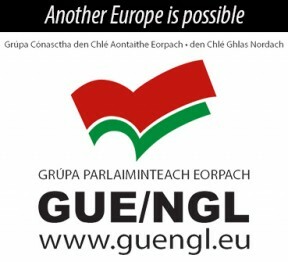 That was so Sinn Féin 2009, Mícheál. The Fianna Fáil leader is opposed to the “fire sale” of state assets – Sinn Féin always have been but Fianna Fáil only when in opposition. In the aftermath of the vote against Croke Park 2, Fianna Fáil now wants a “fair and equitable deal on public sector pay”. Sinn Féin always did – and for all workers! It is back to black for Fianna Fáil.